FORT MYERS. 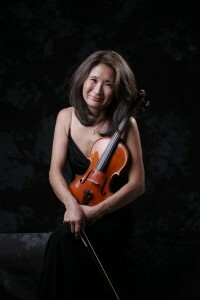 Fla. – Celebrated violinist Reiko Niiya will present “Shall We Dance – Reiko & Friends”, a concert to benefit the Southwest Florida Symphony Society on November 6, 2010 at the Royal Palm Yacht Club in Fort Myers. The concert, scheduled from 5:30 to 8:30 p.m., is a celebration of favorite classical and pops music to be performed by Niiya and her musician friends.As Concertmaster, Niiya is a popular entertainer both within and outside the Southwest Florida Symphony. With her charming and delightful sense of humor and warmth, Niiya calls upon audience members for surprising interaction with the musicians. Audience members are free to get up and dance or just sit back and enjoy the music. Music to be performed that evening includes “The Blue Danube Waltz” and “Shall We Dance” from “The King and I”.The concert is $50.00 per person. To attend, please make a check payable to the Southwest Florida Symphony Society and mail to Nancy Hamann at 6542 Plantation Pines Blvd., Fort Myers, FL 33966- 1321. She can be contacted at 239-768-3275. Checks must be received by November 3rd. via Celebrated violinist Reiko Niiya will present Shall We Dance – Reiko & Friends. This entry was posted on Friday, October 29th, 2010 at 1:24 am	and is filed under Fiddle news and fun. You can follow any responses to this entry through the RSS 2.0 feed. You can leave a response, or trackback from your own site.